The World Junior Championship wrapped up on Saturday as Finland won a thrilling game with the United States to take home gold. But it wasn’t a Finnish or American player who stole the headlines in the final days of the tournament. Instead, the Russian captain, Klim Kostin, found himself at the center of the hockey world’s attention due to his antics at the end of his team’s semifinal loss to the United States. Many have criticized Kostin for his role in the controversy, but that may not be totally fair. In the end, the 19-year-old showed some maturity in owning his misconduct and growing from the experience, but when the dust settles, he’ll still have some growing to do. 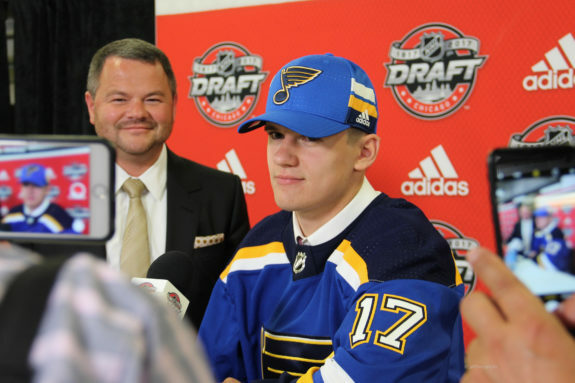 Kostin, whom the Blues selected with the 31st overall pick in the 2017 NHL Entry Draft, was one of the top players and emotional leaders on the Russian squad entering the WJC, so it’s no surprise that he was given the captaincy of the team. But what transpired over the rest of the tournament made some question whether he was a leader to begin with. In his previous life, he worked at a circus. Didn’t you know that? Perhaps he watched the World Cup of soccer, Neymar is probably his best friend. The comments were predictably met with derision by the host nation’s fans. It probably didn’t help that the Russians proceeded to beat the Canadians, who were then eliminated by Finland in their next matchup. He became the favorite target of disgruntled fans and was met with loud boos through the rest of the tournament. Fast forward to Friday night. Kostin’s Russian squad lost a tight matchup with the Americans in the semifinal, meaning they would miss an opportunity at gold. Disgruntled, and continuing to be booed by the crowd, he reacted petulantly. After the game, the Russian captain was set to be awarded a watch as a recognition for being a top-three player in the tournament. First, as he skated up to receive the watch, he took his helmet off and slid it along the ice into the boards. Next, he took the watch and, rather than holding it like his countrymen, handed it to someone off camera — in an action reminiscent of Lias Anderson’s tossing his silver medal into the crowd at last year’s WJC. Then, Kostin refused to look into the camera for the ensuing picture. Each immature action was met with louder and louder boos from the fans in attendance. Obviously emotional after the loss, and disgusted with the fans’ reaction to him, Kostin finished with a flourish by mouthing a profanity to the fans. It was an embarrassing few minutes for the young Russian, who was left disconsolate after both teams had headed to the dressing room. Emotions and frustration had clearly gotten the better of him and he’d looked like a petulant child on an international stage. It appeared to be a heartfelt apology — obviously translated for him, as Kostin is not a fluent English speaker. For Blues fans, who already tended to be on his side, it was enough to put the whole matter behind them. But the Russians still had a game to play. Kostin was not well received. He continued to be met with jeers from the crowd, but he played the game well. The Swiss kept things tight through most of two periods, until he scored on an amazing shot to give the Russians a lead they held the rest of the game. Once again, his emotions arguably got the better of him, as he met the ensuing boos with a pointed goal celebration. The crowd was booing the team and me personally. When I scored, it was automatic, but I wasn’t trying to offend anyone. During the medal ceremony, he appeared to clean up his act. Though he was booed while he accepted his medal, Kostin applauded and saluted the fans. This was again read by some as a mocking applause, but that isn’t the only way to understand it. It may be that the youngster wanted to put the tension behind him and move on. For the time being, Kostin will move on to the American Hockey League’s (AHL) San Antonio Rampage, the affiliate of the Blues. His performance there has improved of late, after the whole team had a difficult start. He now has 11 points in 28 games. Whether he appears with the Blues in the near future remains to be seen. The 2021 Seattle Expansion Draft is not in his favor. If the Blues prevent him from playing 11 games in the NHL this season, they won’t have to protect him when that draft comes around. It seems likely that the Blues will take that option, as it could hardly be argued that Kostin has no more growing to do in the AHL. Each person will ultimately react differently to Kostin’s antics this week. Some will say it’s a 19-year-old who has growing to do and leave it at that. Many will remember it as the controversy that clouded the end of a competitive WJC. And still others are bound to remember his name and have a bad taste in their mouths about him going forward. But, controversy or not, Kostin’s future remains bright. Though many will hold this week against him for years to come, the Blues will not. In fact, childish or not, the young Russian displayed exactly the kind of emotion, heart and passion that a struggling Blues franchise desperately needs. He may have alienated all of Canada, but for Blues fans, he looks like the shot in the arm their team needs.